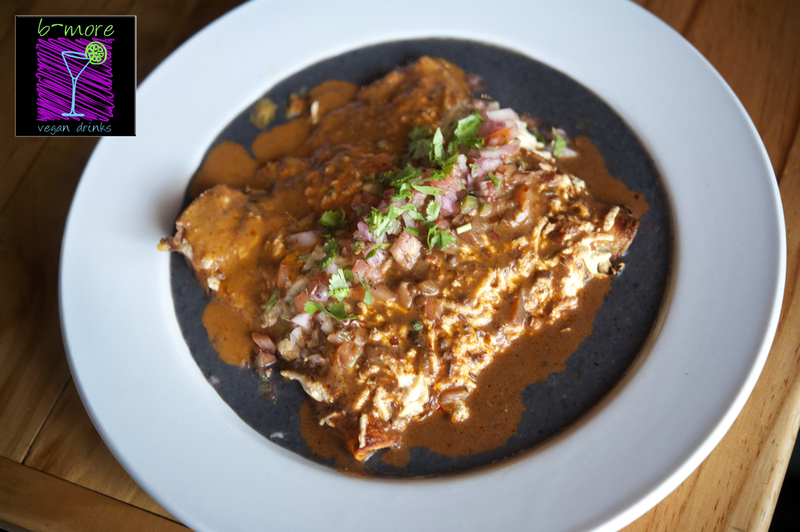 Enchiladas Mole, stuffed with black beans and fresh veggies and wrapped in corn tortillas… and smothered in vegan cheese. 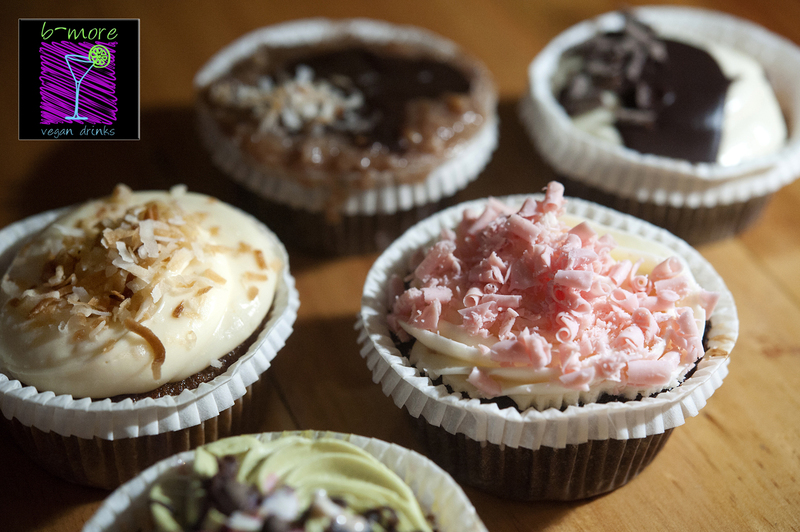 A luscious selection of vegan, gluten-free cupcakes! 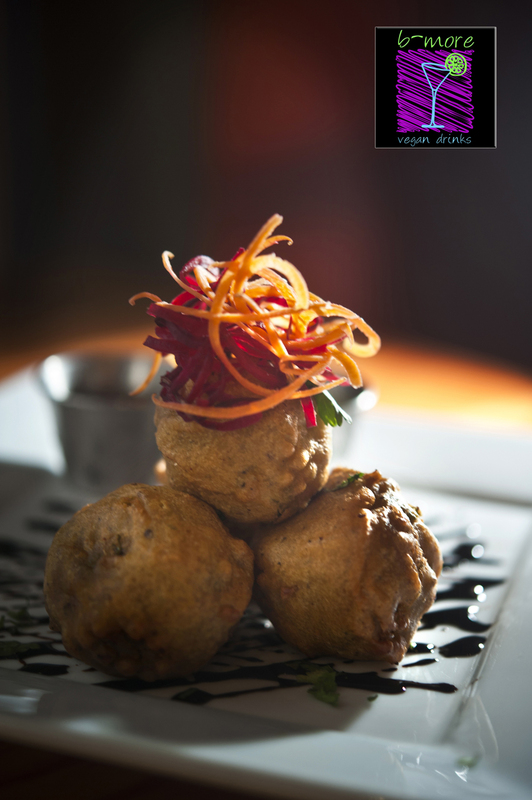 Batada Vada – Potato Fritters in chickpea batter, served with tamarind and mint sauces. Yum! The fun starts at 7pm and goes till 9pm. The event is open to all vegans, vegetarians and veg-interested folks. Meet 27 is located at 127 West 27th Street, Baltimore MD 21218. This is a BYOB event, so feel free to bring your favorite beer or wine – or, buy mixers from Meet 27 and get vodka or rum from Baltimore Vegan Drinks for a donation. For more details, check out the Baltimore Vegan Drinks Facebook page – see you there! Have you ever borrowed money from your mother? You know – like for a car, or even just to make ends meet for a month? Well, we – as in humanity – are borrowing big time from Mother Earth. In fact, every day from now till January 1 of 2014, we are borrowing all the resources we need to survive. Today marks Earth Overshoot Day, 2013. We are living too large on a finite planet – using up resources like land, air and water we may not be able to pay back. August 20, 2013 marks Earth Overshoot Day—the estimated date when we’ve used up the Earth’s annual supply of renewable natural resources and carbon absorbing capacity. After that, we’re using more than the planet can sustain. It’s a one-day reminder of a year-round problem—we are living too large on a finite planet. You probably have a general sense of why. Our human population continues to grow. We are consuming more and more resources. And we still have only one planet. To appreciate just how large we are living in relation to our finite planet, let’s look more closely at some numbers. According to the Global Footprint Network (www.footprintnetwork.org) Earth Overshoot day became an issue around 1975. That’s when humanity’s ecological footprint first exceeded the “biocapacity” of the planet. Before that, our ecological footprint—measured as the area required to supply the food, fish, fiber and energy we consume every year—was within what the planet could sustain. In 1975, there were about 4.1 billion people. Today there are more than 7.3 billion. As the cumulative footprint of our population has grown, Earth Overshoot Day happens 2-3 days earlier each year. Many of our agricultural lands are in places that were once temperate grasslands. So much habitat has been turned under by the plow, that temperate grasslands are the most imperiled and least protected habitat types on the planet. However, the future frontiers of agricultural expansion will most likely be in the tropics as people clear high biodiversity tropical forests to raise cattle, grow soy, and install palm oil plantations. By 2050, the human population is projected to be about 9 billion people. Over that same time, demand for food, water and energy are expected to double. If you think about today’s consumption rate per billion people as a shopping cart, we are filling 7 shopping carts. Earth Overshoot Day reminds us that that level of demand is already putting a huge ecological strain on our one planet. 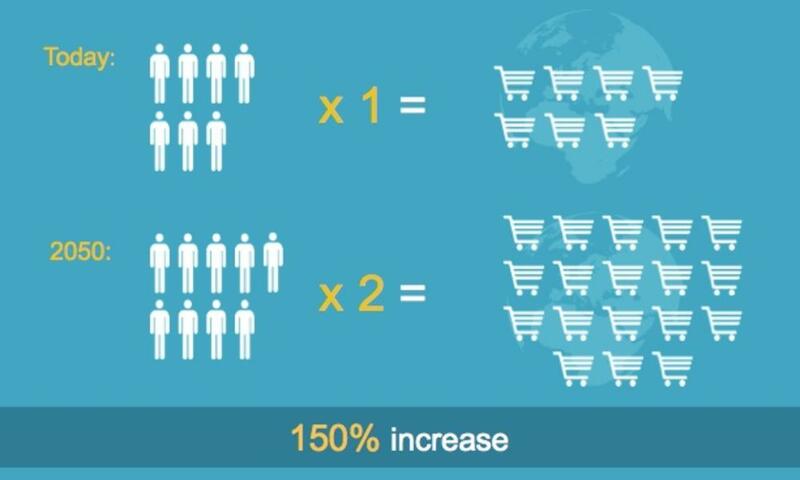 By 2050, 9 billion people will be filling twice as many carts per billion for a total of 18 shopping carts. That’s a 150% increase in demand! A first step is to change the mentality about how we grow food and use other natural resources like forests, water and energy resources. Instead of taking more to make more, we need to commit to making more with less. We need to become passionate about efficiency—more crops per drop of water, more miles per gallon of fuel. It’s a challenge that should inspire innovation and ingenuity about how we produce and use our precious and finite natural resources. We hope this sobering day helps everyone look around and see what they can personally do to help pay back Mother Earth. The options are endless and each little thing you do will help. Need ideas? Go vegan, or at least eat a lot less meat. Buy local — food and goods made locally use a lot less energy. Get non-toxic cleaners, soaps and shampoos to help save our oceans. Turn off lights and unplug your cell chargers. Big spender? Get a hybrid vehicle or install wind/solar power for your home or business. And if you aren’t already recycling, upcycling and re-using all you can, shame on you! 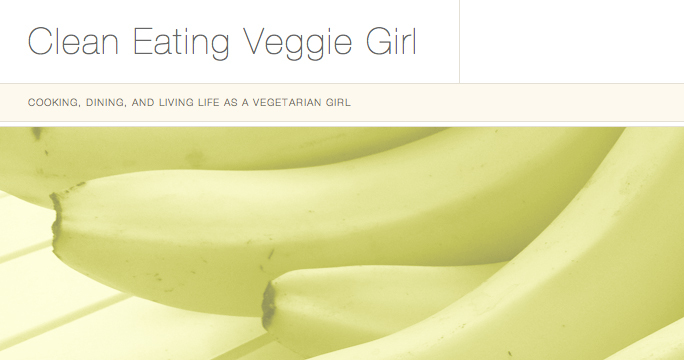 We love other bloggers – like Hannah over at Clean Eating Veggie Girl. Anyhow, when Hannah sent out a request for recipes, we had to submit one. 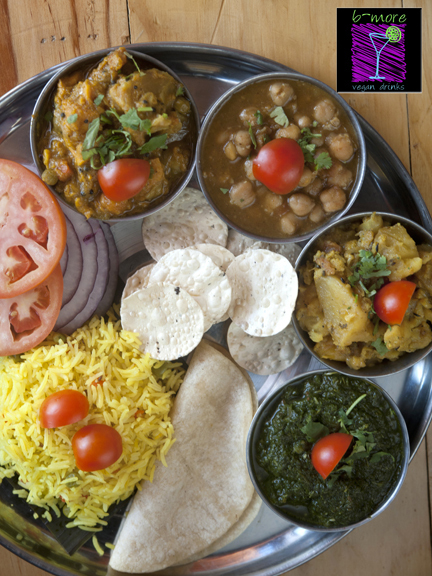 After all, it’s super fun to share food – even if it’s virtually! If you want to check out this recipe for vegan Kale Gratin, head on over to Clean Eating Veggie Girl’s page! It’s easy to prepare and will use up the bounty of kale you can find right now at any Farmer’s Market! The recipe is simple enough for weeknight dinners and decadent enough to serve to even the pickiest non-vegan dinner guest. Greenies love other greenies. Which is why we have big love for the folks over at Sister Eden. They are out there promoting eco-options in every which way and recently, Sister Eden asked us to send a list of our favorite vegan cookbooks to share with readers. It was a tough call, but we narrowed it down by going through our 200+ cookbooks and selecting the books we felt would be best for anyone that wanted to try vegan cooking and baking. If you wanna see our list of top vegan book selections, head on over and check out the post on Sister Eden’s blog! It’s no secret that we adore sweets around here. So, when Doron Petersan’s book, Sticky Fingers’ Sweets: 100 Super-Secret Vegan Recipes , came out in February 2012, we had to pick up a copy. We even got it autographed by the grand lady herself at the 2012 DC VegFest last fall. But it’s taken us a minute to realllly bake our way through it. After all, we don’t report on books unless we’ve used them a great deal. 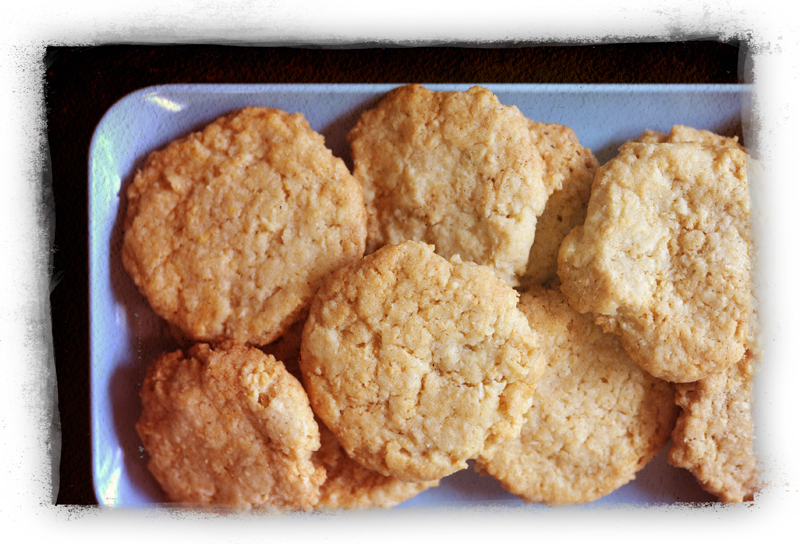 The first recipe we tried was the Lemon Coconut Cookies, found on page 127. If you love coconut, they promise to “make you mad in a good way” – and they deliver! Because these were a birthday gift for a friend, we made 1/2 the batch and still ended up with 36 cookies. What we’re saying is — the recipe makes a lot! 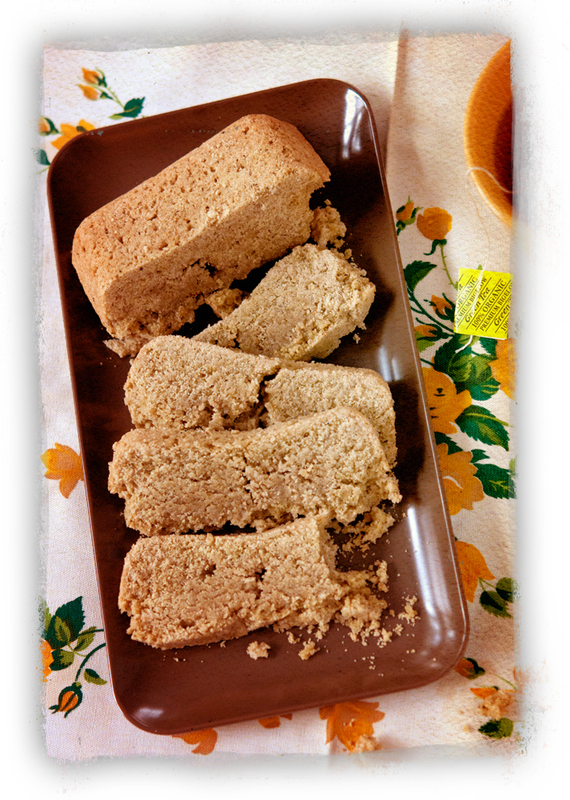 Generally, we found that Doron’s recipes work very well, but make huge amounts of sweets. If you are a big eater, or have a lot of friends and family to feed, that’s ideal. But if you’re single, or only want a sweet lil’ nibble – go ahead and half her recipes! We found they worked in smaller portions, likely because her measurements are so precise. We made a few alterations to the Lemon Coconut Cookies worth noting: First, we didn’t have lemon oil, so we used a drop of lemon extract instead. Instead of 2 tsp. of lemon zest, we included zest from an entire lemon – the gal we were baking for is a lemon fiend and loved it. Because I ate some of the coconut shreds while we baked the cookies, we had to skip step #8, where you add a coconut garnish to the cookies. Oops. It would have been lovely, I’m sure. And finally, we noticed these cookies got kind of crispy as they cooled. 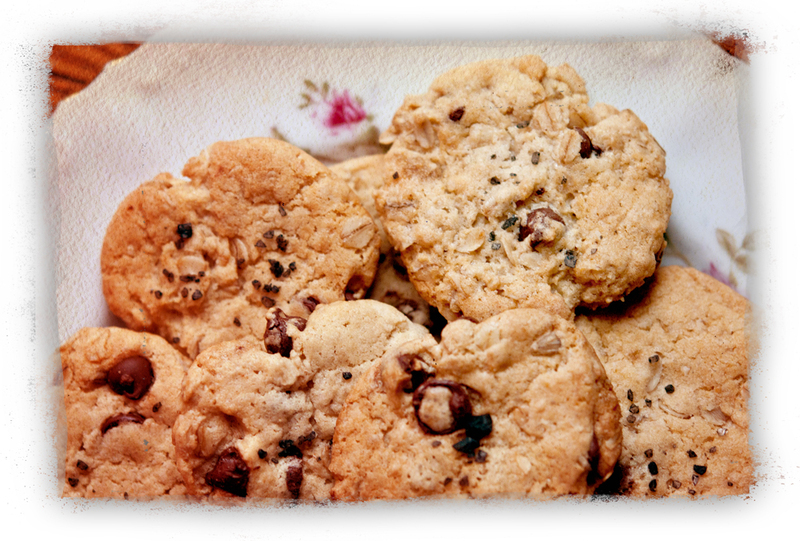 If you enjoy a harder cookie – like to dip in coffee or to have with hot tea, this is a great candidate. 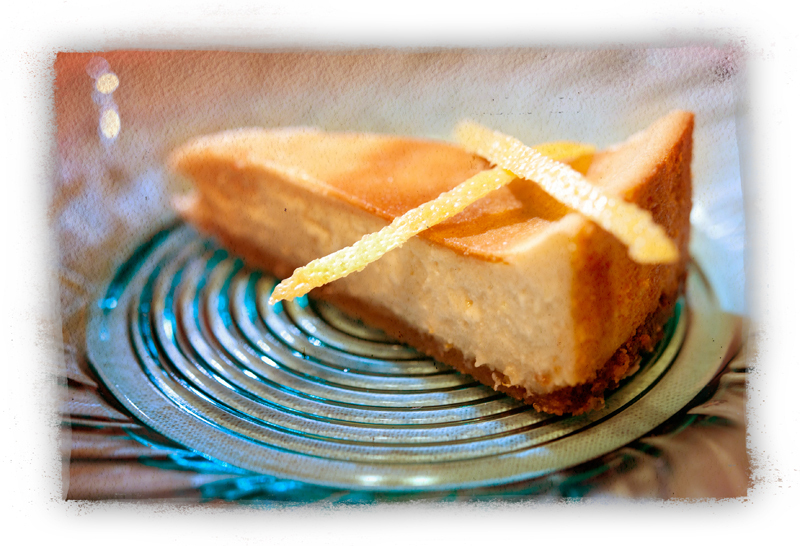 The sweetness of the coconut cookie with the tart of lemon was a winning combination! Our next adventure with Doron’s book was the Strawberry Rhubarb Pie with Crumb Topping on page 209. We made this recipe to share with clients. And not only did they love it, they wanted the recipe to make at home! The pie was bright and delicious, a true taste of spring. But the texture was pretty runny inside when we cut it (we did wait the noted 4 hours before cutting it which is like torture), and over the next two days, it didn’t set up so the crust got soggy, too. Not sure if this was an error on our end or we had overly-juicy fruit. But when I make it again, I may blind-bake the crust in advance and perhaps add a little tapioca starch to the filling. The topping was incredible and unique with pistachios. Yummmm! The recipe made a little more topping than we needed for our pie, so we devoured it with a spoon. Also, don’t forget that catch pan in the oven – when this pie overcooks it is a sticky, gooey mess! This recipe is a little complex. Doron’s instructions are thorough and precise, but I wouldn’t suggest this pie for a complete baking novice. If you’re new to baking, try the cookies and cakes first! Also – it’s crucial to read her introduction chapter… she discusses her techniques and details you may otherwise overlook – like all her measurements are for sifted flour. We’ve also made her Apple Pie on page 205 with the double crust. 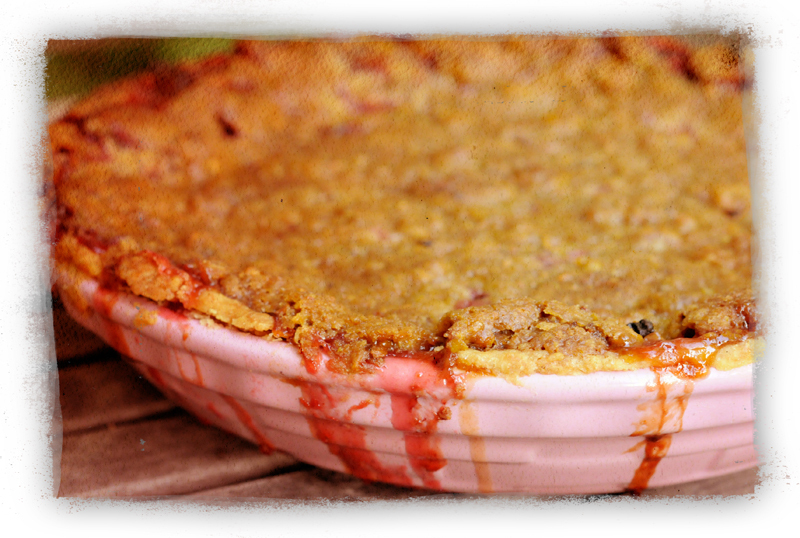 Again, this recipe turns out well – it wasn’t as runny as the Strawberry Rhubarb Pie – but I have no clue if it was the fruit or some other factor. This was a winner at our July 4th celebration. 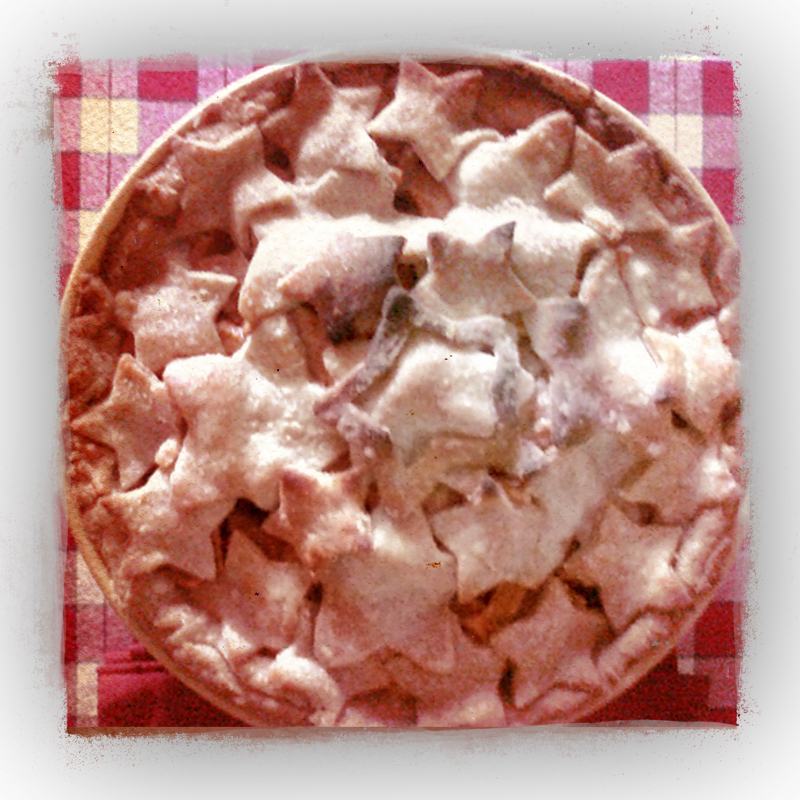 We used star-shaped cookie cutters on the top crust and instead of lattice, built a star-spangled Apple Pie. Gorgeous! When you really need to impress the non-vegans in your family, nothing works as well as cake. In Sticky Fingers’ Sweets: 100 Super-Secret Vegan Recipes, Doron suggests going beyond chocolate for a classy and classic vanilla cake on page 49. Which is just what we did, and paired it with her Peanut Butter Frosting on page 36. The combination won the acclaim of even our fussiest non-vegan family members! My picky-eater nephew literally ate 1/4 of this cake all by himself. No joke. We didn’t follow Doron’s instruction on the peanut butter brand for the frosting, as we don’t buy Skippy – we used Smuckers Creamy Natural instead, which has no trans-fats. Our icing was still plenty fluffy, though I’m sure with her fave brand it would have been even lighter and dreamier. Seriously though, no one noticed. The cake was soft, velvety and moist. The frosting was thick and rich and smooth. Another home-run! From dessert to breakfast. Our next recipe was the Pecan Spice Coffee Cake on page 172. And what about this recipe? Doron promises you will jump out of bed without an alarm when you know this is waiting for you. Yes – it’s that good! I mean, holy crumb topping, Batman! Who doesn’t love a tender coffee cake with a nutty pecan topping? We did make a few alterations to this recipe. First, we toasted the pecans a little in a cast iron pan before adding them to the topping recipe. This gave them a little more depth and flavor. Next, before juicing the lemon the recipe calls for, we also zested it and threw the zest into the cake. Cuz why waste all that lemony heaven? 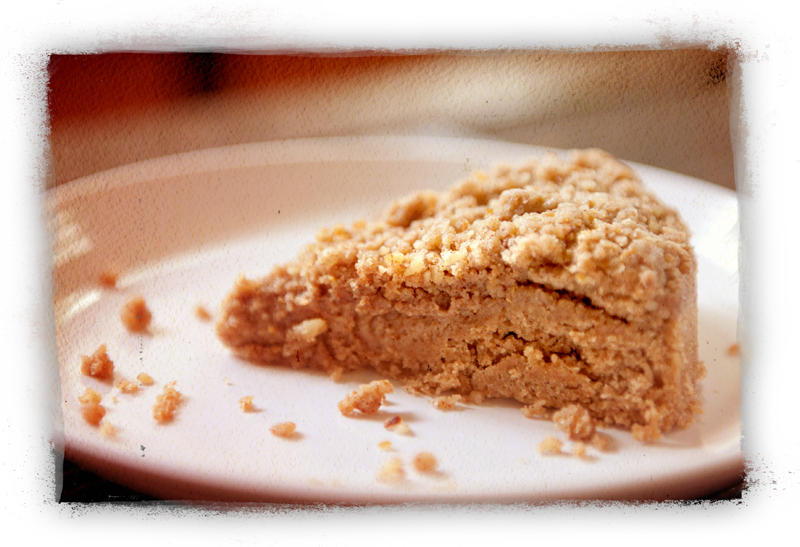 I’m not sure what Doron would say, but we loved the zing it gave this coffee cake. I mean, truthfully, we can use a little zing in the morning to get us going. But the coffee cake was among the easier of the recipes we tried and it was moist and satisfying. A great way to begin your day! 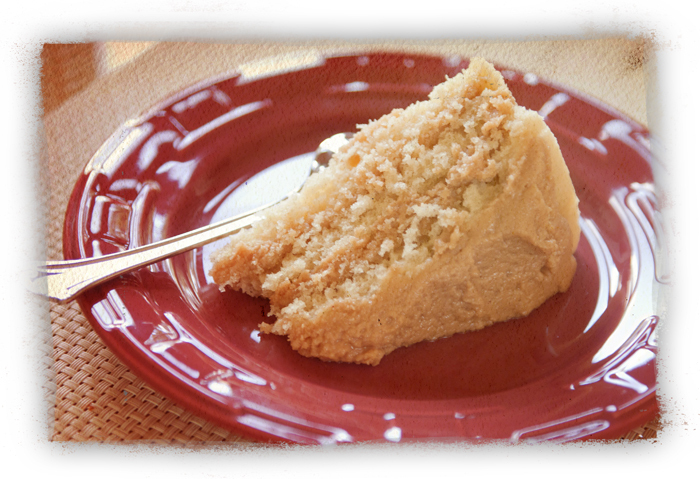 Our only total bomb in Sticky Fingers’ Sweets: 100 Super-Secret Vegan Recipes was the Green Tea Pound Cake on page 266. This recipe is in the chapter from the Seoul-location of Sticky Finger’s Bakery. I’m a green tea maniac – it’s not unusual for me to drink about 8 to 10 cups of green tea on any given day, so I was ecstatic to try this recipe. Doron promises the flavor is like a green tea latte. To which we thought… well, sort of. One so-so cake didn’t slow us down, though. We moved right on to page 135 and tried the Sweet-and-Salty Cookies. These were wonderfully surprising and sophisticated. I know, you’re thinking “How can an oatmeal cookie be sophisticated?” but somehow, it reaches that magical target of both satisfying and upscale. I think it’s the salt and chocolate combo. We used black Hawaiian salt. Scrumptious. Serve this to your foodie friends or take the cookies uptown to impress the types who have personal chefs. We shared them at a friends’ dinner party. Several people asked for the recipe and there were no leftovers to take home. It was only disappointing because I wanted leftovers to dip in my almond milk for breakfast the next day. Doron writes that if you learn to make this delectable vegan cheesecake, “you will want for nothing.” And when you take the first bite, you will know just how truthful she is being! The cracker crust is perfect – lightly sweet and rich. The cheesecake itself – creamy, smooth, decadent, indulgent. Ohhh goodness… I am starting to drool a little just thinking of this dessert. Overall, Doron’s Sticky Fingers’ Sweets: 100 Super-Secret Vegan Recipes is a rock-solid vegan dessert cookbook. Some recipes are complex or require upscale kitchen equipment like a food processor or stand mixer, so it’s not as ideal for beginning bakers. she also prefers dry ingredients to be measured by weight – which is only possible if you have a kitchen scale. She gives cup measures, too, but in her preface, explains that baking is a science and scales are more precise. The chapter “Basics” goes into depth about the equipment and techniques the book utilizes, and it’s important to read this part before you get into baking! If you have the ability to follow directions and pay attention to what you are baking, this book will be very, very good to you. If you need easy recipes and tend to wander out of the kitchen while you work, these recipes might be too much for your current culinary level. We have much more to explore in this wonderful book – on page 52 is a vegan Tiramisu recipe; a Champagne Cake with Passionfruit Frosting is on page 80. Are you a fan of the Bakery? You’ll find Doron’s recipes for Cowvin Cookies, Little Devils and Sticky Buns in Chapter 4. Keep going and on page 193 you’ll see Strawberry Lemonade Whoopie Pies and Chocolate Creme pie on page 248. You can get your own copy of Sticky Fingers’ Sweets: 100 Super-Secret Vegan Recipes online at Amazon or stop by the Bakery in person, 1370 Park Rd NW Washington, DC 20010. It costs $27.50 and is worth every cent – after all, you can’t even pick up a dozen vegan cupcakes at Whole Foods for $27! Thanks Doron, for writing your first cookbook and sharing your super-secret treats with all of us! We look forward to the next book – perhaps revealing the recipes for Sticky Finger’s wonderful biscuits and gravy, no-egg breakfast muffins, cilantro slaw and veggie chili! Mmm…. here’s to dreamin!